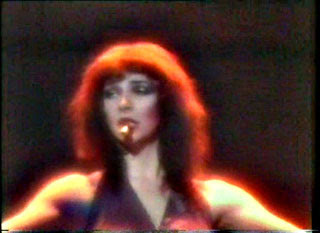 'The Tour of Life' is the only ever tour by Kate Bush. During the 1979 tour, Kate became the first ever singer to use a wireless headset radio microphone on stage, which enabled her to incorporate extensive dance routines into her live shows. A number of reasons have been suggested as to why she subsequently abandoned touring, among them her reputed need to be in total control of the final product, which is incompatible with live stage performance, a rumour of a crippling fear of flying, and the suggestion that the death of 21-year-old Bill Duffield severely affected her. Bill Duffield, her lighting director, was killed in an accident during her 2nd April concert at Poole Arts Centre. Kate Bush held a benefit concert on the 12th May, with Peter Gabriel and Steve Harley at London's Hammersmith Odeon for his family. The tour comprised of 28 dates including five nights at The London Palladium. This is from her concert at the Carr'e Theatre in Amsterdam, Holland on the 29th April 1979. Typical of her determination to have control, she was involved in every aspect of the shows production, choreography, set design, and staff recruitment. The shows were noted for her dancing, complex lighting and her 17 costume changes per show. Genre: Singer songwriter, art rock, pop rock. It is no surprise that most Kate Bush 'unofficial' material tends to be studio outtakes and demos rather than live concert bootlegs, considering she has only undertaken the one tour. This concert was first circulated as a silver disc on Italian bootleg label GDR (GDR CD 9213)back in 1992. The CD was entitiled 'Wow' a song which of course was also performed in the show. Thank you for sharing such a classic silver! Unfortunately, the second rar file has a checksum error in it, and tracks 6, 7, 8, and 9 don't extract for me. Also having trouble w/ tr. 6. Maybe you could check that one again. Great sounding show. Thanks for the background as well, I had no idea why there might be so little live Kate out there.